Make the most of your game with any of the Nike soccer jerseys offered at soccerloco. We offer the best selection of high-quality Nike soccer uniforms from the best teams and players as well as customizable jerseys for your rec team. We offer a wide selection of Nike jerseys for men, women and youth in both short and long sleeve variations at the best deals online to help you save. Every jersey in our store is built to Nike's high standards of excellence from the classics to the latest models. Shop soccerloco now to take your game to the next level. The Nike jerseys we carry are the company's best, made of light and breathable polyester with Dri-FIT technology built into the fabric to keep you cool. With jerseys in both short and long sleeve designs, you're bound to find the right one for your play conditions. Home and away kits from the world's top teams let you support your favorite club in style no matter where they play. Many of our team Nike uniforms can be customized with player names and numbers from those teams like Lionel Messi's FC Barcelona jersey or Robin van Persie's Manchester United shirt. 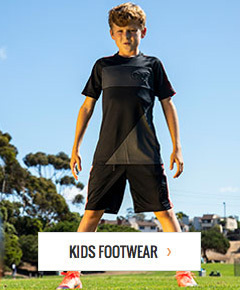 Players and fans of all ages can sport the same look as their favorite club thanks to the variety of sizes we carry. Men and women who play any position can find Nike soccer apparel that's right for them and know that they're getting huge value when they shop at soccerloco. When you want to look through the largest selection of Nike apparel at the web's lowest prices, come to soccerloco, the leading retailer of Nike soccer jerseys and all things soccer online. No matter what you decide on, we offer flat-rate shipping on all orders in the continental US so you can get one of our great Nike soccer uniforms at little cost. If you're not satisfied with your order, don't think you're stuck with it; you can send it back to us because at soccerloco, we've made the return process easy to get you back on the path to finding what you want as soon as possible. Shop with us today to get the high-quality Nike gear you want, without any unnecessary cost or hassle.